Tom Friedman’s best selling book, The World is Flat (www.thomaslfriedman.com/worldisflat.htm) written in 2005 told us the world is flat, fast and connected. National boundaries were less important than people’s ability to instantly connect, for business, learning, shopping and playing. The world was flat and getting flatter. A mere three years later Bob Davis a reporter for the Wall Street Journal (bob.davis@wsj.com) tells us that boundaries do exist and are becoming increasingly important. His article “Rise of Nationalism Frays Global Ties” appeared on the front page of the Wall Street Journal April 28. (http://online.wsj.com/public/page2-0433.html) His perspective is that governments are creating barriers, that protectionist walls are being erected or contemplated. This is no surprise to anyone listening to the US presidential candidate. 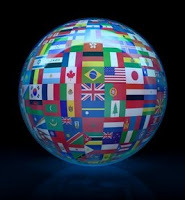 As the world shifts again we’ll see new globalization, new nationalization, new complications. But through it all it is wise to remember that businesses will continue to be global and connected. That people from many places, many cultures will come together. Knowing about the people of the world, how they approach their lives and their business will always be as important as knowing whether the barriers are rising up or flattening out. Global. National. People. Connected.